Miquel Calent is a cook, one of those who from a very young age climbed until the top a mountain of wooden boxes to complete the necessary lack of height due to his age, grasped to Calenta’s grandmother who leaded him to culinary secrets, lessoned and rubbed him–forever- with the tradition off. He’s a cook living the diner to enjoy, knowing which part of the world and which season are we through his dishes. One of those giving importance to what is in the pot. Since many years ago he runs, together with his brother Joan in Campos, the mythical restaurant Can Calent, where they are opened to their both passions: kitchen and wine. Since 2016, besides all this, Miquel Calent also manage Cuit stoves at Nakar Hotel in Palma, where he develops his gastronomic vision in a new context: letting modernity and tradition live together to knead the present. 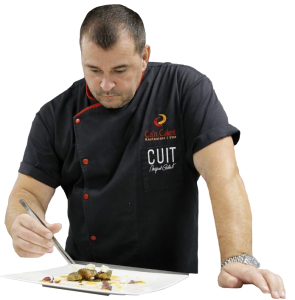 He has been rapporteur thus representing Balearic Islands’ gastronomy in exhibitions like Fitur (Madrid), Biofach (Germany) or Lo major de la gastronomía (Bilbao). He’s also regular contributor in newspapers, radio, television and co-writer of “Aguiant amb el cançoner” about gastronomy and popular Majorcan culture.